Who's foolish enough to not bid on a Batman Tumbler golf cart? I don't know about you guys but I don't have much self control when it comes to awesome things that deserve to be purchased. Even if they don't do anything I can't help myself. See awesome, buy awesome. I assume the entire world operates like that too. So now I'm thinking about how many people are going to put together money to grab this fantastic Batman Tumbler golf cart that's available on eBay. How could anyone resist? It's only $17,500! And for a lifetime (or however long a typical golf cart's lifetime is) of awesomeness, that seems like a pretty great deal. 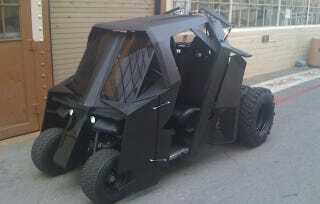 The Batman Tumbler golf cart started out as an EZ-Go Golf-Cart. That cart was stripped down to its frame (and 4 cup holders!) and basically rebuilt with sheet metal and a sculpted, molded cowl. It really does look fantastic.